On Monday 17 February 2014, 12 members of the Cambridge Judge Business School Social Innovation Student Interest Group (SIG) visited five social impact organisations in London as part of a student-led ‘Career Trek’. From capacity building at UnLtd, impact investing at home at Big Social Capital and in emerging markets–at Acumen and Pearson Affordable Learning Fund (PALF)–to the sustainability agenda of big corporations at Unilever; we were fortunate to speak with professionals in the social innovation field who possessed a wealth of knowledge regarding this rapidly accelerating and exciting space. The work that Unilever is doing in sustainability with regard to its wide range of branded products demonstrates an area of huge potential gain. Changing the packaging of some of its products to be more easily biodegradable or focusing on sustainable sourcing might appear to be cosmetic changes, however the effects of the dedicated ‘Sustainable Living Plan’ have far-reaching social impacts for both consumers and suppliers in developing markets. Similarly, the work of UnLtd in supplying seed grants to social enterprises in the UK demonstrates the impact that a few hundred or thousand pounds can have on a social entrepreneur who wants to make transformational changes to their environment. Not only does assistance increase the likely success of implemented changes, it further helps to instil confidence in individuals to go on and explore other areas of business. This confidence-building and integration of positive social capital through capacity-building is crucial for the people with whom UnLtd works in the UK – a high proportion of whom are drawn from social minorities or economically deprived backgrounds. Big Society Capital, through its Social Investment Finance Intermediaries (SIFIs), facilitates the growth of organisations which make social and financial returns. Visiting their offices allowed us to learn about striking the right balances and the challenges they face in doing so. This case study brought our Cambridge MBA Corporate Finance lectures to life; the models Big Society Capital use are relatively unusual, so simply using financial multiples or straight-forward discounted cash flows is not sufficient. When making investment decisions, one has to consider: impact metrics, long payback periods and innovative structured products that allow for social enterprises to achieve long-term sustainability. The case study we worked on at the PALF, led by one of their senior managers, gave Cambridge MBA students the opportunity to play the investor role for a low-cost affordable school chain in India. Bringing together our MBA studies in Organisational Behaviour, Finance and Strategy, we were ultimately split straight down the middle in our decision whether to invest or not. There was excitement in the room as we fought out our positions, examining the value chain, financial and nonfinancial metrics and how the investment motivations fit into PALF’s overall education strategy. At Acumen, we learned about the company’s pioneering impact investment work across various sectors using patient capital models operating as a non-profit social venture fund in the developing world. Particularly inspirational was Acumen’s strong focus on leadership: for its investees, employees and wider affiliated community, through its urban chapters, fellow programmes and online courses. 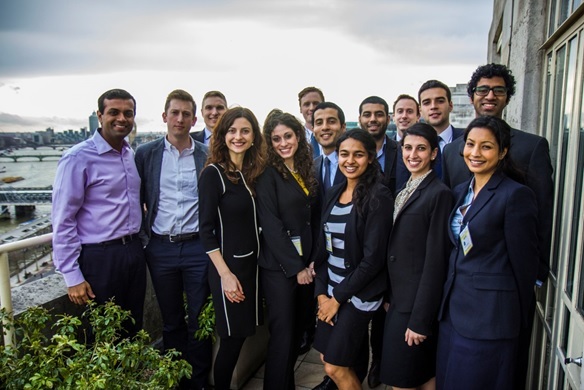 The crossover with various parts of the Cambridge MBA course is a reminder that making a difference for the good of the world is not at odds with normal business practice, but an integral part of it. Having met and learnt from people at these organisations, it is clear that the Cambridge MBA class has the capacity and drive to really add value to this sector. In utilising our skills drawn from core Cambridge MBA modules-interpersonal skills from Management Practice and valuation exercises from Corporate Finance as well as understanding the drivers for success from Strategy; we believe that a business education is central to a career in social innovation.